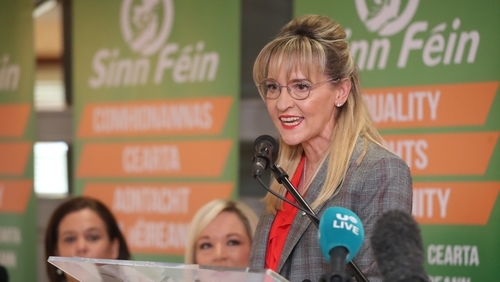 Sinn Féin's outgoing MEP for Northern Ireland, Martina Anderson, has been confirmed as the party's candidate for the 24 May European election. The party's Vice President Michelle O'Neill said today that the voice of Martina Anderson is needed now more than ever in Europe. Ms O'Neill was speaking at a party selection convention this morning in Belfast. Ms O'Neill said: "The new European Parliament will be elected at a time when the EU will face many challenges, and all the while Westminster remains in paralysis and political meltdown." She said her party's team in Europe "has been dogged in campaigning on behalf of the majority view in the north and successfully influencing the EU27. That has been reflected in the current Withdrawal Agreement and Backstop. "No Brexit is good for Ireland but the backstop will mitigate against its worst consequences." Ms Anderson has been an MEP since June 2012, when she succeeded Bairbre de Brún. The other two outgoing Northern Ireland MEPs are Diane Dodds of the Democratic Unionist Party and Jim Nicholson of the Ulster Unionist Party.